If Star Trek has taught us anything (and let's be honest, it has), it's that when alien species make first contact, there's a wealth of possible outcomes; friendship, adventures, romance, heartfelt learning, and maybe a friendly game of baseball. Of course, we all know the more likely outcome is shaky alien alliances, tense negotiations, and outright global obliteration. So set your phasers to FUN, because it's time for another Light Grey Game Night on Wednesday, October 1st, from 6:30 to 9:30 pm! As you might remember, we're attaching a theme to each night to help people narrow down what games they might want to bring (although you're still welcome to bring whatever you'd like!). This week's theme is Spaaaaaaace! We're going to have an interstellar slugfest in the negotiation classic Cosmic Encounter, prepare for a quickly escalating arms race in Star Realms, or duke it out for the moon's dwindling Rubium Ore in Nexus Ops, among plenty of others! If you have a favorite space-themed boardgame, bring it! 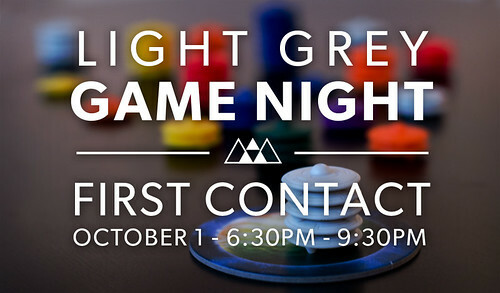 So grab your friends, family or favorite stack of board games, and come play with us! RSVP via our Facebook event, and feel free to share! The more the merrier! Also, here's a sneak peek at the next few Light Grey Game Nights, so you can plan accordingly!